KPMG LLP audit confirms Alexander Zacke guilty serious trade violations, including insider trading & shill bidding using his name and false identities. It is irrational to condone the extensive trade violations committed by Auctionata CEO Alexander Zacke and make him CEO Paddle8|Auctionata global management team. Although Alexander Zacke dismisses the severity of the violations by stating they are mistakes; United States law considers the trade violations as civil and federal offenses, which can result in serious fines and criminal prosecution. 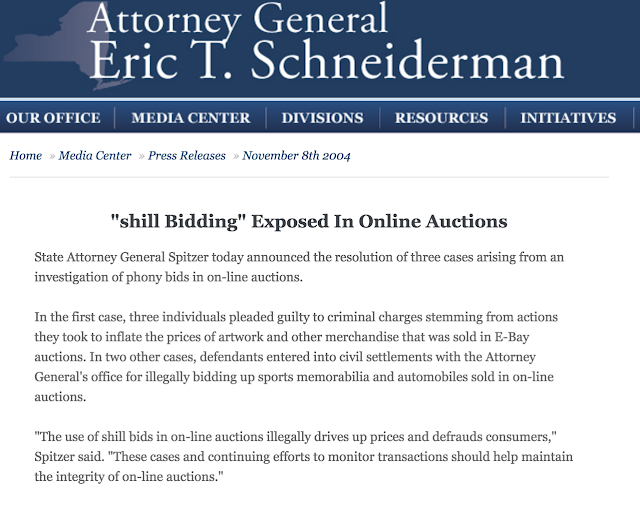 Shill bidding is frequently used by fraudulent online auction sellers to artificially increase the ultimate selling price of online auction lots by creating the illusion there is "buyer interest" via other bidders competing for the respective auction lot in lieu of actual buyers with real bids. Often online auction sellers that engage in shill bidding usually bid on the respective lots themselves, other shill bidding auctions engage friends and/or family to place the shill bids. Although no specifics have been released, the KPMG audit confirms Alexander Zacke, Auctionata CEO, and Suzanne Zacke, Alexander Zacke's wife, who is Auctionata Chief Information Officer, used both their own names and false names to bid on numerous lots in 2013 and 2014 Auctionata auctions. With shill bidding, the respective lot always fetches a substantially higher price than it would have if only legitimate buyers bid on and purchased the respective auction lot. New York Attorney General Eric T. Schneiderman is committed to prosecute individuals and corporations who engage in shill bidding, and would not be moved by Alexander Zacke's excuse that it was a "mistake" that is often made by start-ups. 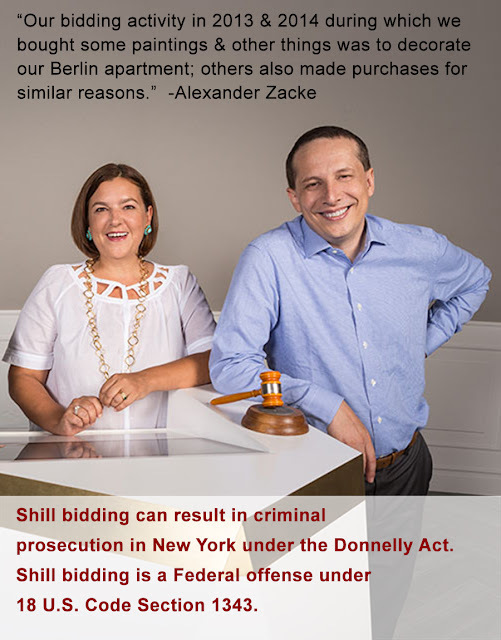 In New York State, shill bidding is a serious criminal offense prosecuted under the Donnelly Act which prohibits antitrust activities such as shill bidding to artificially increase prices in online auctions, also known as bid rigging. Under the Donnelly Act, the Attorney General can impose civil fines up to $1 million for corporations and $100K for individuals. Illegal shill bidding is also prosecuted as wire fraud, a federal offense under 18 U.S. Code Section 1343; the maximum wire fraud penalty is 20 years imprisonment. "Our bidding activity in 2013 and 2014 during which we bought some paintings and other things was […] to decorate our Berlin apartment; others also made purchases for similar reasons." "Naturally we made mistakes in the beginning, but such mistakes are common in start-ups. It would be rather astounding had this not been the case." Alexander Zacke began his auction career in 1990 at Dorotheum, the Austrian auction firm as an Asian art expert; in 1995 Alexander Zacke was terminated after a scandal raised questions about the consignment sources responsible for the significant increase in Asian art consignments; Zacke never addressed the source of the consignment increase, many tracing to Alexander Zacke family's Asian art business, established by his mother, Irene, identical to charges noted by KMPG. The German Press is evasive as to why Alexander Zacke left Dorotheum in 1995 as department head of Asian art and avoids the consignment source topic as well. Alexander Zacke states on linkedin: "I took over their Asian art department with an annual sales level of 1 million ATS. When I left the company four years later, annual sales were at 45 million ATS." Zacke has a long history of exaggeration and hyperbole. The lapse in judgment by Alexander Zacke regarding shill bidding is hardly credible, especially for a CEO of an auction firm and, whom former eBay CEO Meg Whitman said " no one in Europe knows auctions than the Zackes". No ethical auction firm anywhere allow consignors, employees, employers, assignees and/or agents to bid on their own material, and to do so with false names is more troubling. It is more troubling the Zackes did so with pseudonyms as this may be a sign of intentional malice. Frankly, it is reminiscent of the accusations Zacke received when he was a so called eBay Titanium Seller; he did so with private auction listings, and never allowed publication of actual sale prices, and actual number of bids. In fact, eBay sellers who have private listings are often accused of using shill bidding to power sales. Auctionata should immediately provide a detailed recap of the extent of shill bidding using real names and false names, along with all lots receiving single and/or multiple shill bids. Auctionata claims it is transparent, but we are unaware of any hard data confirming this pledge. It behooves Auctionata to immediately issue a detailed recap including all lots inappropriately purchased by Auctionata CEO Alexander Zacke, his wife, Auctionata Chief Marketplace Officer, Susanne Zacke and other Auctionata full-time employees, part-time employees and board members. The KPMG audit shows significant ethics violations that would not be tolerated by any reputable auction house, including Sotheby's and Christie's. The total number of lots and consumers affected by the illegal activity. The resultant settlements lot by lot Auctionata will provide customers for the illegal activity. List of lots that were bid on using shill bids by Alexander and/or Suzanne Zacke using their own names. List of the specific lots Zacke used pseudonyms to bid on, and why? List of lots that were actually purchased by Alexander and Suzanne Zacke. All items and total money spent to purchase lots to decorate Zacke apartment. Detailed list of the shilled up amount, lot by lot caused by the shill bidding activity. List of the sold/unsold lots Zacke consigned and how much he received as an advance. List of the lots Auctionata employees/board members consigned and whether they received advances. Auctionata press releases and financial statements proclaim alleged growth of its online auctions, even though 50% of all auction lots are unsold. A recent Auctionata press release boasts 2015 gross revenue of €81 million, yet mostly hyperbole and a lack of hard evidence support the alleged revenue for the "leading online auction house which offer a flawless selling experience". Questions persist about five 2015 art lots sold for over $200K each, most with competing bids, that are all erased from sold auction results, as well as the numerous 2015 lots in other categories such as cars, watches, clocks, etc., many apparently sold with competing bids, yet also magically erased after the sale, an issue not addressed in the recent KPMG audit. Auctionata should issue revised financial statements for 2013-2015 purging lots with shill bids, along with settlements paid to customers affected. Releasing detailed financial statements purging the lots with shill bids, and adjustments for the inappropriate non-arms length consignments and advances would ensure Auctionata financial statements have justifiable support, not hyperbole, shill bidding and smoke & mirrors. 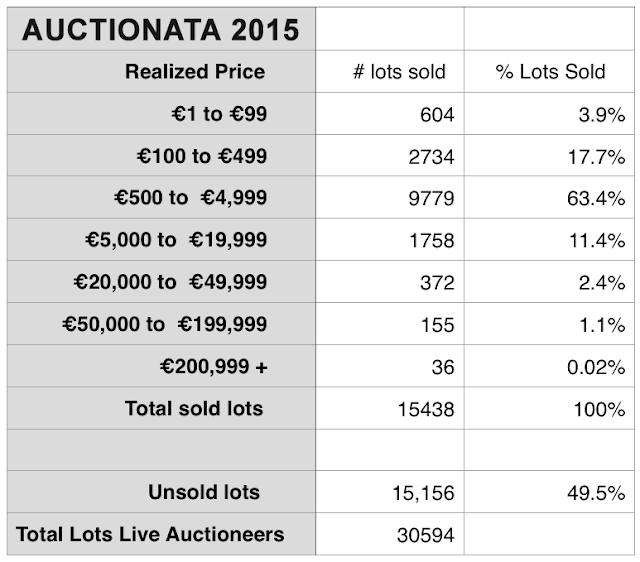 Auctionata claims 2015 gross revenue of € 81 million, yet there is no information to support this claim. For reference, the German auction firm Ketter Kunst generated € 53 million in gross revenue in 2015. It appears the Auctionata website is purposely technology deficient, thereby exacerbating the third party queries for financial details, including macro-reports by category, by year, by artist/type, etc. Contrary to Auctionata press releases and financial statements, 63.4% of 2015 sold auction lots had hammer prices between €500 to €4,999; further analysis shows 85% of sold auction lots fetch hammer prices under €4,999. Unsold Auctionata lots average about half of all lots, but many art auctions have even more severe unsold rates; in a sale of 100 "so called" Masterworks on 12/7/15, only 23 lots sold, translating to 77% unsold lots. In a November 2014 article on Luxury Daily, Auctionata falsely claimed "most items sell in our auctions between $5,000 to $20,000" ; aside from the slight differences in the euro, (at one point Auctonata added +30% conversion to the US dollar), the truth is only 11.4% of all Auctionata lots sold for €5,000 to €20,000; hyperbole is sure swell! According to 2015 results on Live Auctioneers, 5 Lots of Art for over €200K, but in reality NONE sold. In most cases, these sold lots disappear from Auctionata's website even though the respective lots had multiple competing bids, all above the low estimate, and by law, the reserve, the non disclosed amount in which the property can be sold. 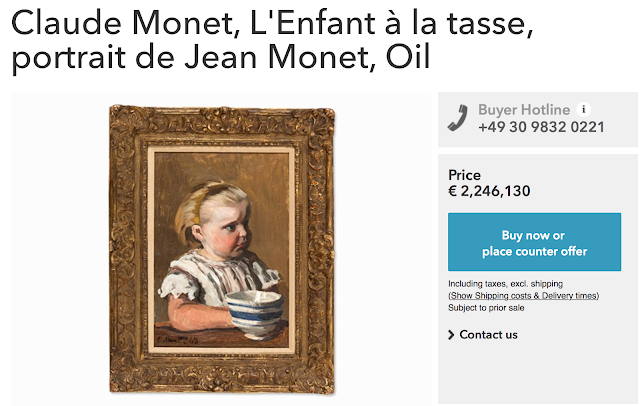 We could understand it happening once, but every 2015 art lot that fetched over €200K is missing, yet, according to Auctionata, art accounts for 22%: how? According to 2015 macro data available on Live Auctioneers, 5 art lots with a hammer price exceeding €200K, 2 of which were identical, sold in 2015, with a gross hammer price of €1.42 million, but none really sold! However, all of them had competing bidding activity so what happened? Were these more examples of manipulated shill bidding? Auctionata press releases and financial reports include unnecessary hyperbole, bias and mysteriously erase all unsold lots which account for at least half of all lots offered. Unsold lots plague Auctionata; during 2014, 42.5% lots went unsold; in 2015, unsold lots increased to 49.6%, yet, you would never know it from any of the official Auctionata press releases or statements. Unsold lots are a serious problem as Auctionata, yet Auctionata never discusses any plan to improve the problem, because Management has decided to bury the entire issue. It appears significant shill bidding activity prospers like weeds at Auctionata well into 2015 and 2016. More troubling is the number of identical 2015 lots sold repeatedly by Auctionata, accounting for several millions dollars, most of which had competing bids that were equal to and in many cases, substantially higher than the low estimate (and obviously met the reserve), sometimes with 5, 10 or 15 competing bids, yet the lots are magically erased on and from Auctionata website. 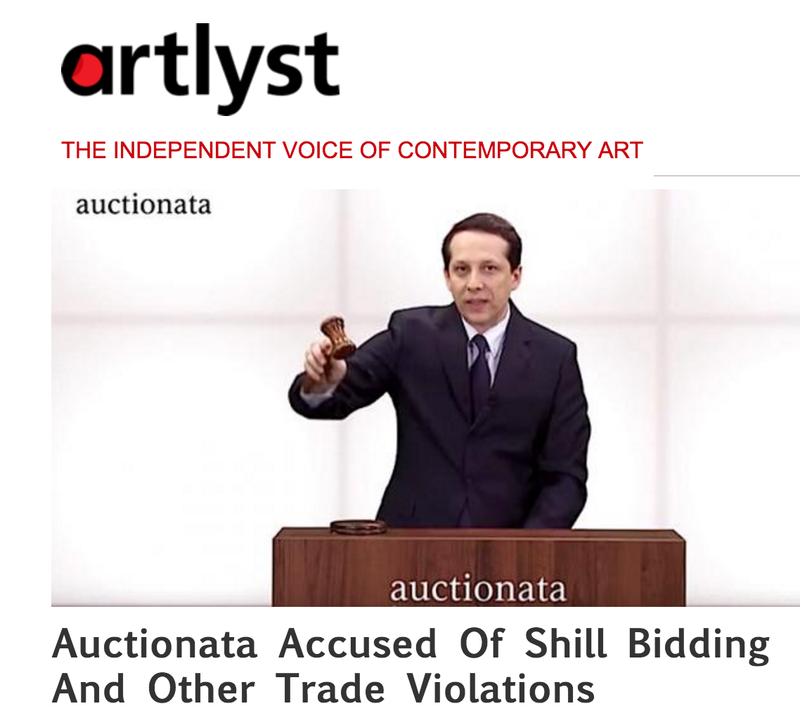 Contrary to Alexander Zacke's pledge that shill bidding has ceased, something is going on at Auctionata that is permitting this activity, which is reported by Live Auctioneers. What happened to Paul Klee Auctionata purportedly sold for €200K on 6/24/15; it shows up on Live Auctioneers, but is erased on Auctionata? Live Auctioneers indicates there were 5 competing bids, resulting in a realized hammer price of €200K, well above the € 160K-€200K estimate. 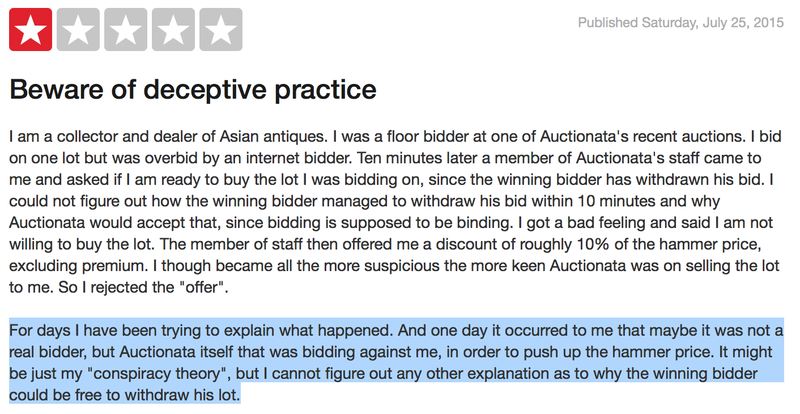 How does Auctionata Management explain competing six figure bids, each at the low estimate and higher, all magically disappearing without explanation at the "leading online auction house which offer a flawless selling experience"? 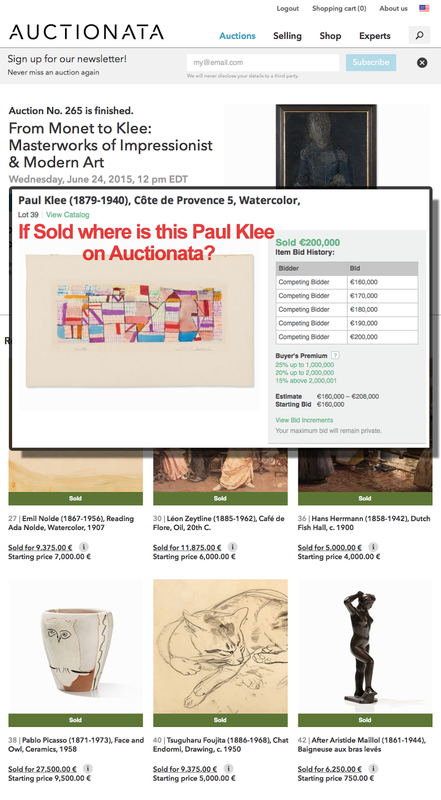 What happened to the Paul Klee sold in Auctionata auction on 6/25/15? Who placed the competing bids or were they shill bids? 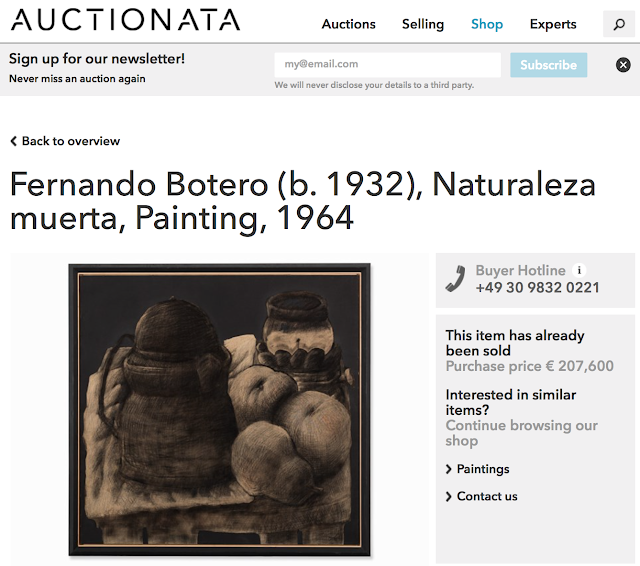 Why was Fernando Botero Naturalize muerta, 1964, that purportedly realized €240K hammer price, not including buyer's commission, on 6/19/15 with 11 competitive bids completely erased and replaced with an online store sale at unknown date for €207.6K? Where did the competing bids come from? Were they all shill bids to prop up sales in the weak art category? 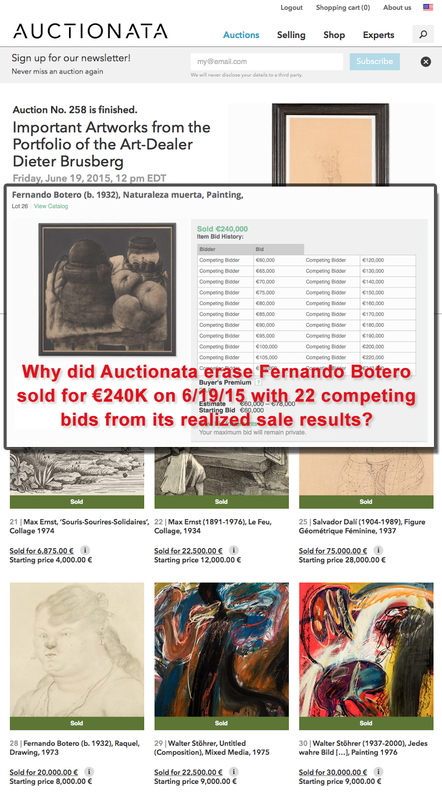 If sold with so many bids, where is this Botero painting on Auctionata sold auction results? Search Auctionata website & learn Botero painting actually sold for €207.6K in Auctionata store. What happened to is this Claude Monet painting sold with 10 competing bids, well above the low estimate, for €380,000 on 6/24/15? available at the outrageous price of €2,250 million. Neither Paddle8 nor Auctionata has issued any details to support the alleged statement of $140 million in combined sales. While The New York Times reports Paddle8/Auctionata had $140 million combined sales in 2015, there is no public support to confirm this. In fact, Auctionata claims it is the leading online auction, yet it is ranked as one of the least desirable online art platforms by Hiscox. In addition, reviews on Trustpilot and Yelp are alarmingly negative, with complaints of extensive fees, shill bidding and unilateral implementation of forced selling at below market prices if an item doesn't sell. Together, Paddle8 and Auctionata will grow the underserved global mid-market in this space. While legacy brick-and-mortar auction houses dominate the high-end of the collectibles market, online secondary marketplaces at the opposite end of the spectrum cannot provide transparency and authentication. This leaves a gap where the middle market, for objects up to $500K, is vastly underserved. Both Paddle8 and Auctionata have independently pursued this market, and together they are poised to win and grow the sector. Contrary to the Paddle8/Auctionata press release, according to the Hiscox report, 49% of lots sold online are under $1,000 and 79% under $5,000; coincidentally consistent to our analysis which shows 85% of all Auctionata sold lots are under €4,999. Alexander and Suzanne Zacke used their Management positions to create an unknown series of artificial bids and consigned over 500 lots, yet to date, neither has been penalized, fined and/or terminated. Zacke and his wife are blind to obvious conflicts of interest, consigning 600 auction lots, receiving a substantial $569K advance even though the valuations were questionable, paperwork missing. Not addressed in the report is whether Alexander Zacke and his wife purchased any lots from the Auctionata consignment store, and if so, why hasn't this list been provided as well? Contrary to Zacke's stance the shill bidding has ceased, former Auctionata employees confirm routine breaches of impropriety via reviews on Glassdoor. Former employees say "Auctionata routinely uses phantom bidding; cooks up numbers; questionable statistics; and has a lack of buyers and poor organization." Although Auctionata responded to the KPMG audit, stating: "since mid 2014, the company has been continuously working on the improvement of its internal compliance and governance structures", former employees apparently don't agree. The KPMG audit indicates the Zacke's repeated violated auction trade regulations by not establishing any arms length relationship. The KPMG report supposedly details the lots the Zacke's consigned, yet thus far, Auctionata has not released details, in conflict with Auctionata's 3/31/16 response which states transparency has long been a priority. Disturbingly, the KPMG audit shows Alexander & Susanne Zacke consigned 600 lots or about 22% of these lots, receiving an aggregate advance exceeding $569K. How many of these lots sold? How many were consigned by other so called Auctionata paid by the minute experts? How many were consigned by Board members? And how many of these lots were then bought by the Zackes? Additionally, the KPMG audit bizarrely indicates Auctionata condones consignments from Auctionata employees and fails to impose a limit to Board members. Zacke impeaches himself stating "questions regarding the board and who consigned what are irrelevant," he said, because "the auditors confirmed without restriction that all economic activities by this company in 2014 and 2013 were found to be proper." At Auctionata the pass rate can exceed 80%; it is essential Auctionata issue a list of Zacke's bids, purchases, consignments and unsold lots too; as much of Auctionata's purported sales results would be drastically reduced. The charges of unusual buying and selling activity by Auctionata's CEO and his wife, also an officer, is particularly troubling. Unlike Sotheby's, Christie's and Phillips, Auctionata doesn't publish auction recaps showing total realized prices of the auctions as originally presented, including both sold & unsold lots so that the information can be cross checked. Furthermore, Paddle8 never publishes any sale information, making it impossible to confirm the actual extent of sold vs. unsold material. Reviews by under bidders & consignors on trustpilot contradict Zacke's defense. Auctionata faces fines, revocation of its business license, significant reputation damage or closure. "These violations could result in fines, revocation of business license, significant reputational damage. In extreme cases Auctionata may not be able to continue business operations". 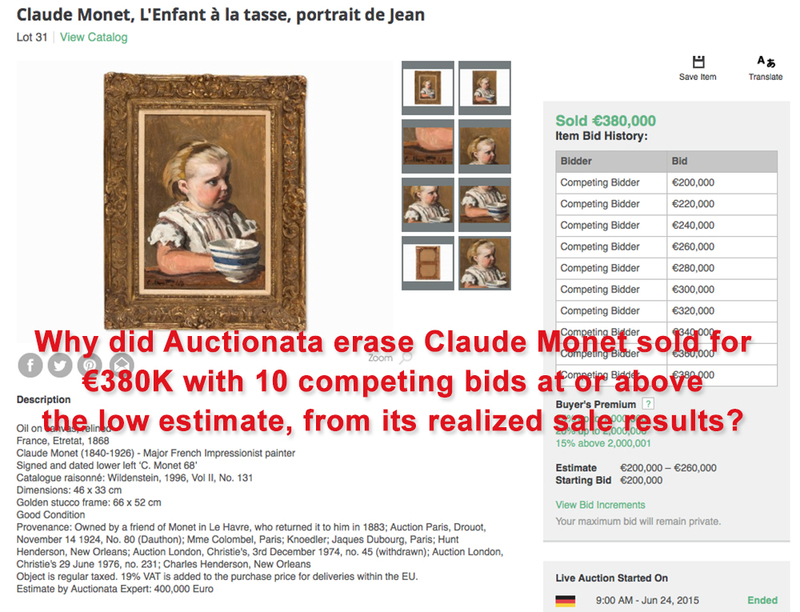 We believe Auctionata should be severely reprimanded, if not completely shuttered, as this type of misleading activity sullies the art market. Is the merger of Paddle8 and Auctionata a way for the Zacke's to sidestep the penalties recommended in the KPMG audit? 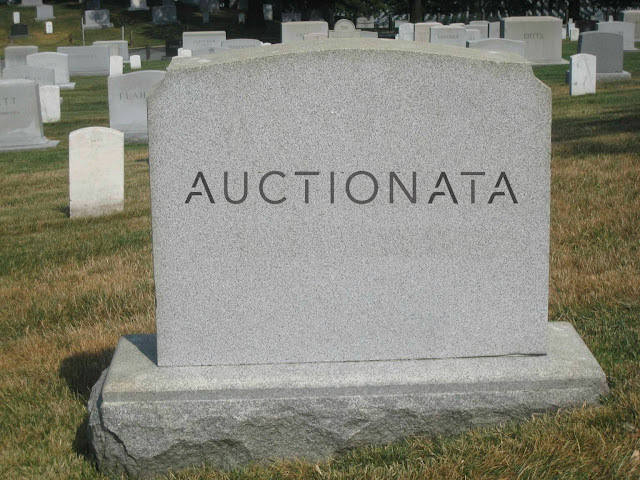 Auctionata, the online auction house, declares bankruptcy!